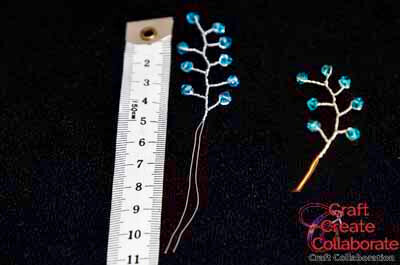 You will need these few items to practice the skills in this tutorial for crystal wire tree branch basics. 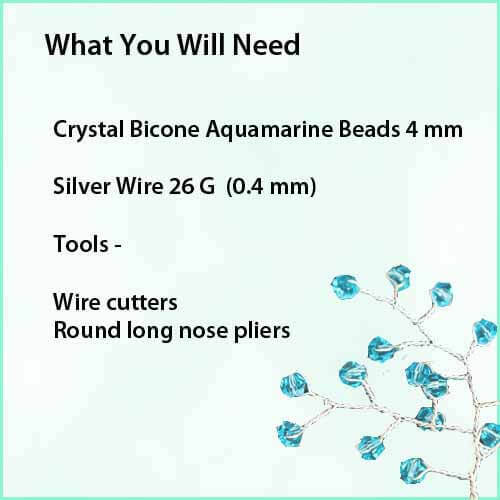 Use any color beads, this wire will take beads between 3 mm and 5 mm. Cut a piece of wire around 36 cm (14 inches) long. Put a soft bend at the halfway point. 2. Squeeze the wires together under the bead. 3. 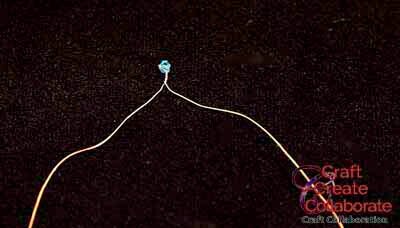 Twist the wires under the bead 4 times. The number of twists under the beads is not important but have enough to develop what you are trying to achieve. For now, do four or five twists. 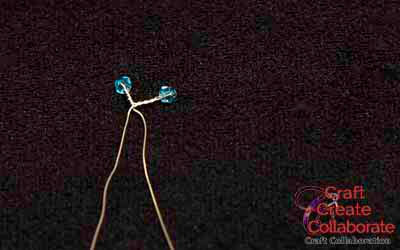 You have the first bead on the wire, that was not too hard and it does not get much harder, wonderful. These tips may prevent some frustration. Working with wire – try not to bend and unbend the wire, it is soft so that we can make beautiful things with it, but bending and unbending will break the wire. The difference between a wrap and twisting wire – they have a different purpose and technique. Wrap – one wire is kept still while the other wire wraps around it. Twist – Keep the two wires involved and apart and either twist from below or from above, whichever is the most comfortable. 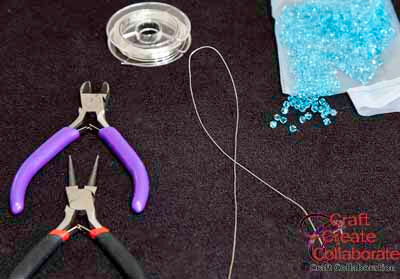 Twisting from the bead end, hold the wire apart with your index finger, hold each wire with other fingers and twist the crystal. Make sure that both wires are engaged in the twist. When making branches and tree trunks the twists do not have to be perfectly even, give your branches some character like they have in nature. 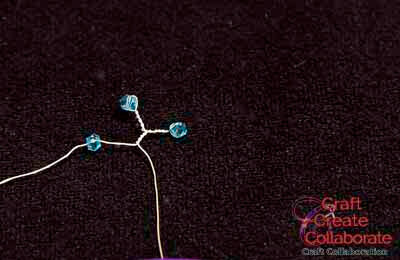 For wire trees, I buy wire that is called ‘dead soft.’ Just ‘soft’ would be OK too. For practice, quality crystals are not necessary. 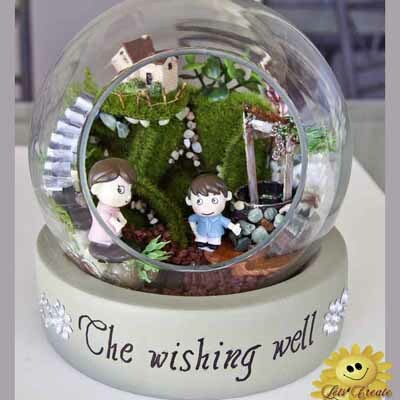 Projects of this nature are a lot of work, so don’t waste your talent on dull crystals. I tried several suppliers before I was satisfied. I needed economy and quality. I have Swarovski crystals for very special projects. 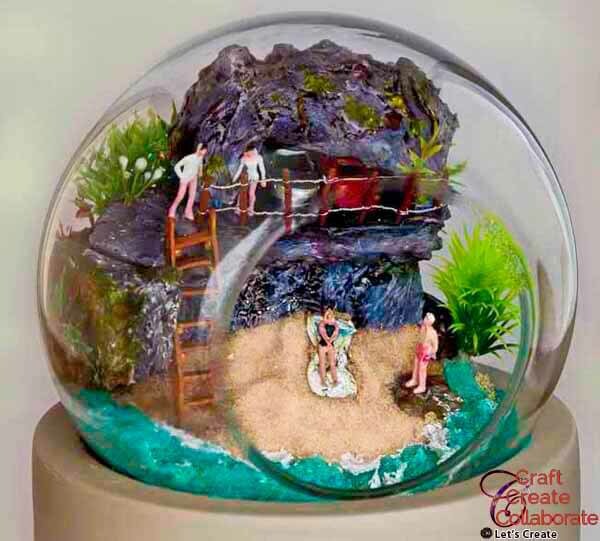 Obviously, they are too costly for most crystal creations. 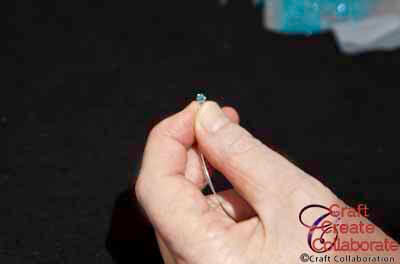 Thread the second bead, bend the wire and squeeze about 1 cm from the first bead. Now twist until the twists come back to the twists under the first bead. Do four twists under where the two wires meet. 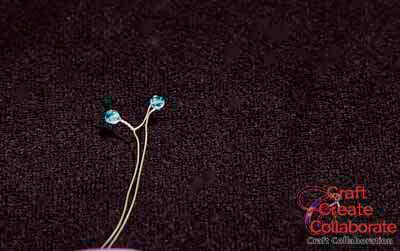 Add beads to alternate wires so that the wire tails stay roughly the same length. 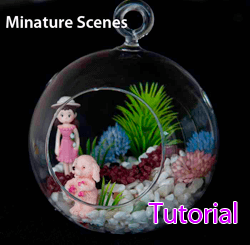 Do not worry about the position of the beads they can easily be positioned when you have finished the branch. 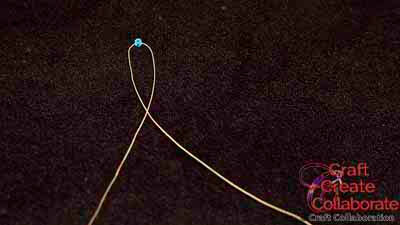 Follow the same pattern – Thread > Squeeze > Twist back to the other twist, now do four twists with the two tail wires. The arrow is pointing to a small gap, it would look better without the gap – do one twist of the third bead to remove the gap. Keep working down the wires in this manner to finish the branch. 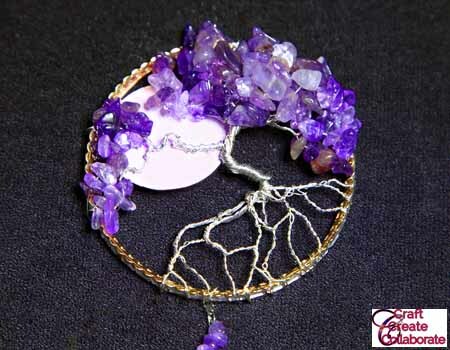 The first branch has nine crystals. 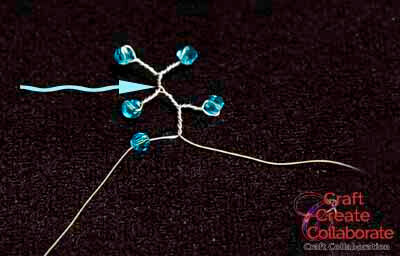 Now make a smaller branch with seven crystal. The second branch is made in the same manner as the first branch. The arrow shows the end of twists for the two branches – twist them together to form a thicker branch. To make a tree we would make several more of these branches. 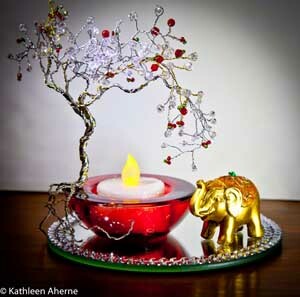 This is a small tree scene that I made using gold and silver wire with clear and crimson crystals. You can see how the root system is used for added interest. 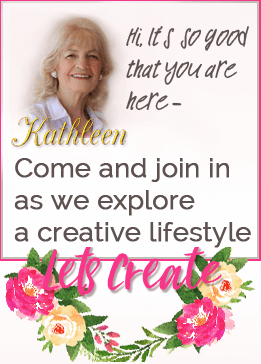 Buy your craft supplies where ever you can find the best price. My store has a limited range of craft supplies at great prices. If you would like a quote for any item at all I will check with my supplier to see what price I can get it for. Make your requests in the contact form in the footer, also let me know what country you are in.